Stuttgart - 1899 Hoffenheim earned Baden-Württemberg bragging rights with a comprehensive 3-0 victory away at regional rivals VfB Stuttgart, who were poor throughout. Takashi Usami gave the visitors a dream start with a delightful solo goal, before second half strikes from Joselu and Fabian Johnson sealed a thoroughly deserved three points for Hoffenheim. The hosts did not begin like a team with just two points to show from their opening four games and attacked aggressively in search of an early goal. They should have gone in front too, when Gotoku Sakai looped a cross into the box and Vedad Ibisevic - back in the side after a two-game suspension - narrowly missed the target with a brave diving header. 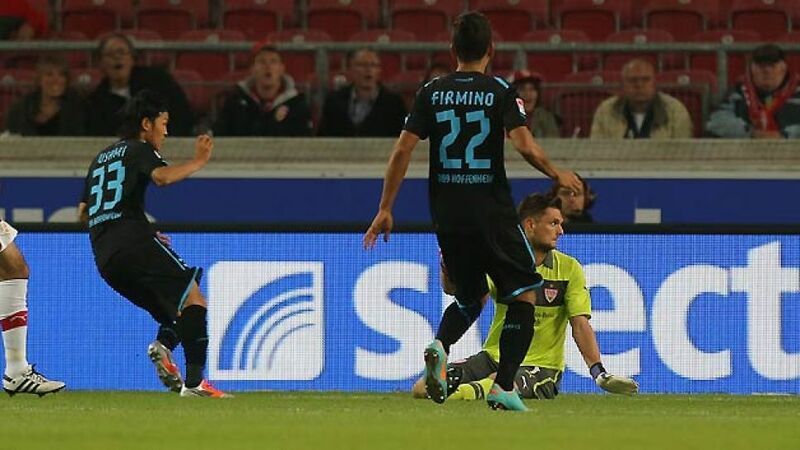 Hoffenheim kept their wits about them, however, and took the lead themselves with their very first attack. Usami collected the ball on the left of the pitch, still 40 yards from goal in a seemingly harmless position. The Japanese midfielder dribbled his way forward, taking on five Stuttgart defenders in the process before rolling the ball coolly past Sven Ulreich in goal. Usami was involved in the guests' next chance too, taking up a similar position before feeding Fabian Johnson with a superbly weighted through-ball, but this time Ulreich came out on top. Having started so brightly, the hosts were suddenly deflated and devoid of any self-belief. Passes went astray with increasing regularity, the team lost its shape and Hoffenheim predictably went for the kill. In their fragile state, the Stuttgart players sought safety in numbers, cramming their defence in a desperate attempt not to go further behind. Indeed, the only criticism Markus Babbel will have had of his side is that they did not add to their lead prior to the break. That changed within seconds of the restart though, as Roberto Firmino instigated a rapid counter-attack, feeding Joselu, who skipped past Serdar Tasci and fired in from 15 yards for his first ever Bundesliga goal. If Stuttgart were struggling prior to that, they looked well and truly in disarray afterwards and it proved to be the knockout blow. By contrast, Hoffenheim were reveling in the space and freedom afforded them by their hosts and, urged on by Babbel on the touchline, continued to attack. Inevitably, Stuttgart's resistance was broken once again, although they only have themselves to blame. A counter attack was only half-heartedly tracked, allowing Hoffenheim three shots on goal - two of which were expertly saved by Ulreich - before Johnson prodded the ball over the line on the rebound. With an eye on Saturday's match at home to Augsburg, Hoffenheim eased off and were content to keep possession in order to protect their lead. Neither side created any further chances of note, leaving the visitors to celebrate a second successive league victory and a first ever over Stuttgart.